That's what my mom taught me and it stuck, along with make sure to wear clean underwear in case you're in an accident. Jen nominated me for this award! "This award is for those bloggers who are nice people; good blog friends and those who inspire good feelings and inspiration. Also for those who are a positive influence on our blogging world." I love it! It's so nice to be appreciated for niceness. Thanks Jen! Step forward and claim your award! Thank you, Diana! 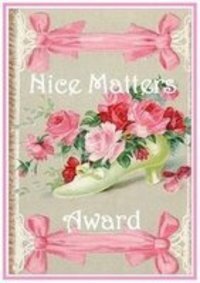 I appreciate the award and agree that you certainly do deserve recognition for being nice. Does everyone's mom tell them about the clean underwear thing? Cuz my mom did too. Wonder where that comes from. And niceness does deserve recognition, doesn't it? Doesn't seem like it gets much in this world. That is so sweet of you, Diana! I am honored to be in such wonderful company. I need to give you the URL for my personal blog, though...the one at cathye.blogspot.com is one for word puzzles and things for my college kids from church, and they haven't been viewing it so I haven't updated it in quite a while. 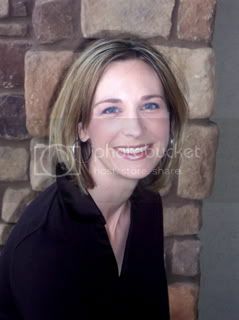 My personal blog is cathye48.blogspot.com. Lillie, you are too kind! Jen, of course everyone's mother said that, but what I want to know is when did it start being said? I've passed on the award to several others. Thanks again.